High sun protection cream (spf50) with a fluid, moisturizing texture and pleasantly​ perfumed. Ideal for use in first solar exposures, this face cream moisturizer, is suited to all skin types, even the most sensitive and intolerant to the Sun. Is advisable to use a sunscreen spf50 on the face throughout the year. Choose which facial solar protection is most suitable for you. Apply generously before sun exposure. Renew the application every 2 hours, after bathing or physical effort. 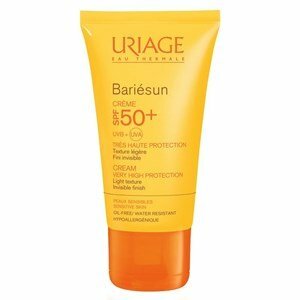 Bariésun is the line of Uriage protectors, created for normal, sensitive, light skin, or for the firsts exposures to the sun when it is essential to use a very high protection. Antioxidant and anti-aging action with stabilized vitamin C, vitamin E and Uriage thermal water. Intense hydration of the skin with AquaSpongines. A line of care adapted to each skin type and every need.